The Reserve Bank of New Zealand (RBNZ) is the central bank of New Zealand. It was established in 1934 and is constituted under the Reserve Bank of New Zealand Act 1989. The Governor of the Reserve Bank is responsible for New Zealand's currency and operating monetary policy. The Bank's current Governor is Graeme Wheeler. Employees of the bank operate under the framework of a managerial hierarchy. Unlike the United States Federal Reserve, the Reserve Bank does not have elements of private ownership; according to its website, "The Reserve Bank does not have shareholders. It is 100% 'owned' by the New Zealand Government, with any extra revenue that the Reserve Bank makes going back into the Crown accounts. The Central Bank is not a government department, but is a body corporate whose finances are included in the Crown accounts." The Reserve Bank's primary function, as defined by the Reserve Bank of New Zealand Act 1989 is to provide "stability in the general level of prices." The Reserve Bank is responsible for independent management of monetary policy to maintain price stability. The degree of price stability is determined through a Policy Target Agreement with the Minister of Finance. Policy Target Agreements are public documents and hence a government cannot secretly change the targets to gain a short term surge in economic growth. The mechanism of this is the Official Cash Rate (a percentage) which affects short-term interest rates. The Bank will provide cash overnight at 0.50% above the cash rate to Banks against good security with no limit. Furthermore, the bank will accept deposits from financial institutions with interest usually at the official cash rate. Banks that offer loans at interest higher than the official cash rate will be undercut by Banks that offer cheaper loans, and banks that loan out lower than the official cash rate will make less compared to other banks which can simply deposit their money in the Reserve Bank with a higher rate of return. The Reserve Bank borrows and offers loans with no limit on volumes in order to ensure that the interest rate in the market remains at the Official Cash rate level. Through controlling this, the Reserve Bank can then influence short term demand in the New Zealand Economy and use this to control prices. Adjustments to the official cash rate are made eight times a year. It can make unscheduled adjustments but does not usually do so. Like all modern monetary systems, the monetary system in New Zealand is based on fiat and fractional-reserve banking. In a fractional-reserve banking system, the largest portion of money created is not created by the Reserve Bank itself, 80% or more is created by private sector commercial banks. The Bank by virtue of the Reserve Bank Act has the sole right of issuing New Zealand legal tender notes and coins. The Reserve Bank controls the issuing of currency to banks and also replaces used and damaged money from circulation. In March 2005 the bank decided to remove the 5 cent coin from circulation (the following year), as well as reducing the size of 10, 20 and 50 cent coins. The Reserve Bank accepts all New Zealand currency for payment at face value. This applies to all demonetised or withdrawn currency, however such currency need not be accepted by money changers as it is no longer legal tender. All decimal notes are legal tender except $1 and $2 notes as these have been withdrawn. Damaged notes are still worth something so long as they are recognisable. The Reserve Bank website notes that as a rule of thumb if there is more than half a bank note they will pay its full value. To receive payment people have to turn in the note to either the Reserve Bank in Wellington or any bank. The Reserve Bank from time to time produces limited runs of legal tender coins for collectors and have a New Zealand theme and design. These coins do not circulate, but are legal tender. The Coins are sold for the Reserve Bank via New Zealand Post's business unit. The Reserve Bank also acts to supervise the New Zealand banking system to ensure that the system remains healthy, however it does not guarantee that a bank will not fail, or face problems. As of February 2016 there are 25 registered banks. All registered banks operating in New Zealand must issue a quarterly disclosure statement, and the Reserve Bank supervises these. More information, see list of registered banks at the RBNZ website. Under Part 5D of the Reserve Bank of New Zealand Act 1989 (the "Act"), the RBNZ is charged with the enforcement of the credit rating and prudential requirements applying to non-bank deposit takers (NBDTs) in New Zealand. These functions were introduced by the enactment of the Reserve Bank of New Zealand Amendment Act 2008. Further amendments to Act have been foreshadowed to complete the regulatory framework for the NBDT sector. Under section 12 of the Insurance (Prudential Supervision) Act 2010, the RBNZ is charged with the prudential supervision of the New Zealand insurance industry. This includes the licensing of persons to carry on insurance business in New Zealand. The Reserve Bank of New Zealand was established from 1 August 1934 by the Reserve Bank of New Zealand Act 1933. The Reserve Bank first issued banknotes in 1934, see New Zealand pound. ↑ Singleton, John (11 April 2012). "Reserve Bank". Te Ara - the Encyclopedia of New Zealand. Retrieved 19 April 2012. ↑ "Monetary policy in `Interesting Times'". rbnz.govt.nz. ↑ "Policy Targets Agreement" (PDF). rbnz.govt.nz. ↑ "New Zealand Post Coins". nzcoins.co.nz. ↑ "Register of registered banks in New Zealand". rbnz.govt.nz. ↑ "Overview of NBDT regime". rbnz.govt.nz. ↑ "Governors of the Reserve Bank - past and present". Reserve Bank. Retrieved 9 February 2016. 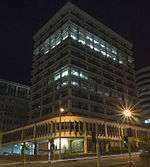 Wikimedia Commons has media related to Reserve Bank of New Zealand.